Decks West Monroe: What is a Pergola? At Ready Decks, we are proud to offer our customers the very best in decks, pergolas, and patios. With each of our installations, we give extra attention and care to make sure each project is done correctly. When it comes to deck installations, you want to make sure that each project is done on time and correctly the first time. Any small mistakes are very easily spotted and cause problems in the future. For example, if a deck isn’t properly installed, uneven planks could be a safety hazard and could hurt someone. Also, if the deck is unstable, your outside lounge area would be a severe safety hazard, rather than a luxury feature of your house. Though our customers have been exceedingly impressed by the work we do, some still don’t fully understand our business. 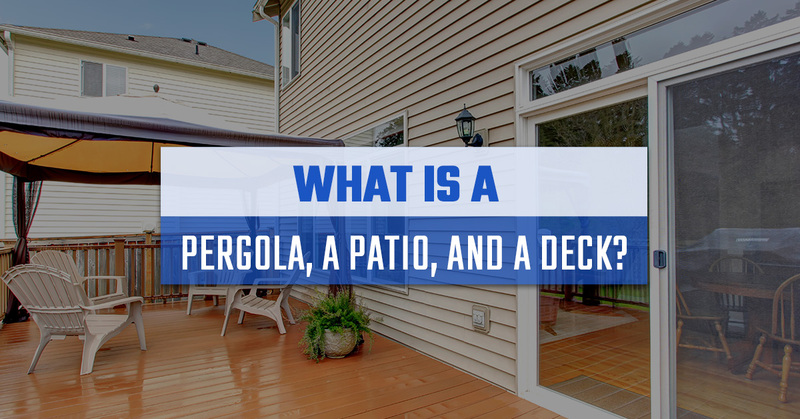 Specifically, our customers have become a little confused by the differences between a pergola, a deck, and an outdoor patio. All of these items are strikingly similar; however, there are minor differences that set them apart. In this blog, we will discuss the differences between these outdoor seating areas and how your home could benefit from them. Pergolas are excellent additions to your backyard for many reasons. For one, you can use it for shade from the sun. Second, a pergola is a great feature to use to relax after a long day. A pergola, sometimes called an arbor, is a garden feature that acts as a sort of passageway from your deck to your main yard. Typically, a pergola will feature a small sitting area and large pillars that attach to an overhead cover. The cover is supported by cross beams and a sturdy open lattice. Pergolas will generally feature some sort of vine or greenery growing on them. Because it is traditionally a garden piece, most owners will train woody vines to intertwine with the beams. If you like the look of a pergola, constructing it is easy. However, how you place the pergola in conjunction with your house will change its design slightly. For instance, if you build the feature away from your house, it will act as more of a gazebo, rather than a pergola. If you want the feature built closer to your home, it can act as an extension of your home, such as a patio or a deck. Decks and patios are a little more difficult to discern from each other — however, there are still minor differences that separate them. For instance, decks are primarily made of wood or vinyl. The more popular deck materials are woods, such as redwood, cedar, and pressure-treated pine. Decks can be attached to your home or completely separated. Decks can also be different heights as well. For instance, some decks can be elevated to be around your house, which often means they will need railings. These features can also be adapted to encircle your pool as well. Pool decks are a great feature to any home because they will dramatically reduce the likelihood of slipping around the pool and make outdoor activities more entertaining. Decks can also feature other things too, like a barbeque pit, a seating area, or an outdoor bar. All of these features are perfect for entertaining and dramatically increase the price of a house. Patios are desirable because they are very similar to a deck but take much less work to maintain. For example, patios can be made with any material. Whether you want to work with tile, stone, concrete, or wood — the choice is up to you! Similar to a deck, patios can be created to coincide with your pool areas. Pool patios can be a great addition to any home because they can give you a nice area to dry off and tan after you are finished swimming. Why Get Any of These Things? All of these features add an extra “entertainment factor” to your home. Whether you choose a pergola, a deck, or a patio, each offers an added element to your home that is sure to impress any guest. Best of all, you can fully enjoy the outdoors on your days off. These features are also wonderful for your children. Instead of staying cooped up in your house, an outdoor area will allow them to play freely outside and give you a comfortable place to sit and watch out for them. If you are interested in improving the overall look of your home, a deck, patio, or pergola will certainly do the trick! With an installation of any of these features, you could beautify your home and offer guests a gorgeous seating area to take in the southern nature. Contact Ready Decks today and we can get a deck installer to inspect the area you would like to build on. Call now!